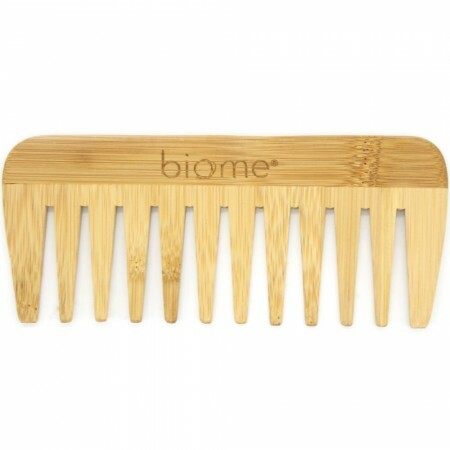 A wide tooth comb from Biome, made from bamboo. Bamboo is a sustainable and environmentally sound material. Brushing your hair with natural bristles can also improve the health of your hair. Bamboo is a renewable timber that grows rapidly without pesticides. A sustainable solution to plastic alternatives. Compostable at the end of its useful life. Made from MOSO bamboo, which is the bamboo NOT eaten by Pandas. Heat treated bamboo, no varnish. Great for detangling wet or dry hair. 15 (L) x 7 (H) cm, with 5cm (L) teeth. Allow the comb to dry before storing it. This is a natural wood item so becoming wet will speed the decomposition process. Browse our natural hair styling products.